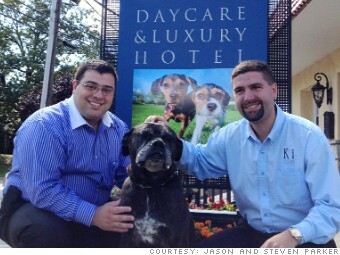 Jason and Steven own an Italian mastiff named Rocky who is K-9 Resorts' unofficial mascot. But we loved what we were doing anyway. So we opened [a luxury dog hotel] in 2005 and it was an immediate success. Jason: [To set ourselves apart, we have] cage-free rooms and suites, outdoor window views, and plasma TVs playing "Animal Planet." Steven: In 2010, we started franchising, and we [just] sold our sixth franchise. We plan to open 100 stores within the next three to five years. It's the American dream. We're first-generation Americans and came from humble beginnings, and we're just getting started. We want to be the Donald Trump of the pet care industry. We like to have fun, too. Jason bought a Maserati. We took our mother to Hawaii for her wedding anniversary and to her hometown in Italy.